It seems like ‘04 hasn’t been a “booming” year for archery. But we’ve been surprised to notice just how steady archery has been over the last few years, even after 9-11. There has been much uncertainty in the U.S. and in the world as a whole. And uncertainty is almost always very bad for sales in sports and other “discretionary” consumer spending. The world wide war on terror, oil prices, out sourcing, the U.S. election,... things just aren’t as steady and predictable as they were some years ago. On the other hand... there are some very positive things happening. We have made some very encouraging progress in getting more kids exposed to archery. Archery is returning to our schools. Archery is showing up even more often in movies and the media. The animal rights nuts haven’t been defeated, but they continue to damage themselves as the rest of the world sees their agenda for what it is. The seemingly universal human interest in archery appears to be as strong as ever in both kids and adults. At Trueflight, we’ve continued to ship lots of high quality “missile guidance” equipment in ever more choices of color, pattern and size. We’re looking forward to doing that again – even more and better for next year! More stable raw material prices and quality along with steady small improvements in our production efficiency have enabled us to hold the 2004 prices unchanged for 2005. We are now producing our very popular Trueflight Barred patterns in two new colors. Pink Trueflight Barred have dark bars on a Pink background, while Blue Trueflight Barred have dark bars on a Blue background. The Blue Barred make for a nice rich, handsome arrow – just the kind of thing King Arthur would use for his personal arrows. The Pink Barred make a wild, eye catching, highly visible arrow. We’ve been surprised by the interest in both of these new barred colors. With these additions we now offer a total of 12 Trueflight Barred colors, as well as 14 solid colors. We haven’t yet been able to count the total number of different color and pattern combinations it is possible to put on an arrow with all these choices. It’s somewhere over 1000 different combinations! And that’s not counting variations in size, shape, wing, and number per arrow. I don’t think my pocket calculator goes high enough to add all those possibilities! All of our Trueflight Barred are being made through our new “Phase 3" process. The Phase 3 process really makes for a nice looking barred pattern. If you haven’t seen our barred within the last year or so, we’d be happy to send you samples of the new Pink and Blue Barred or any other colors. Just mail or email a request. You can also have a good look at the new Pink and Blue Barred colors on our web site’s “Products” page, www.trueflightfeathers.com/products.htm. If there’s one thing we need to be doing for the future of archery, it’s getting more kids interested, involved, and excited about “bow shooting”. I’m happy to report that quite a number of folks are doing more and more to get kids into archery. “The National Archery In The Schools Program” which started in Kentucky, is another very positive program. It has been picked up by several more states. This is a new take on the old (and very sensible) idea of Archery as part of the physical (and mental!) training which should be part of every school’s educational “mission”. One new twist is having an archery tournament between schools which takes place over the internet What a great idea.... schools can compete against each other without transportation costs, or worry. And schools half way around the world can compete almost as easily as schools next door to each other. You have to love the idea of humanity’s oldest “high technology” and it’s newest working together and keeping kids engaged in something more meaningful than video games. One of the great pleasures I’ve had in this business is seeing how much the archery industry and archery enthusiasts in general have done to make sure more kids have the chance to try archery, to enjoy archery, and to learn from archery. Ishii himself, I think, would be pleased. I hope that this letter finds you all in good health and spirits. As our busy Archery season starts winding down, our thoughts seem to drift toward spending some quality time relaxing in one of our favorite blinds or treestands, no matter where that might be. Family and Friends, together again to share some of the best times. You just can’t beat the Friendship, good stories, and fine food! I sure hope that all of your time in God’s great outdoors will be Blessed with the best of comradery and success. Speaking of Bowhunting success, did you know that Wisconsin for the past several years has lead all other states with the number of entries into the Pope and Young record book? The good news is a non resident in Wisconsin can still purchase an Archery license over the counter. The cost is still a pretty good deal, when you compare that to Illinois or Iowa. Buffalo County is the number one hot spot in our State for tagging a trophy whitetail. However, Northern Wisconsin counties like Oneida, Vilas, Price, Iron, Ashland and Bayfield turn in their share of trophy bucks each year also. So if your not having any luck getting a tag in others States you might want to consider giving Wisconsin a try! This year we tried to save you some money on your UPS shipping charge with the development of our new 10m box. Years ago, our old 15m box was a good deal up until UPS changed their shipping rates to oversize 1 and oversize 2 categories. The 15m box because of its oversize was considered an oversize 2 box was billed for 70#(pounds) when all we had for weight ranged between 24# and 28# pounds. This was not a good deal . The new 10m box is smaller and when full of 4 die cut feathers it weighs about 16# it is considered a oversize -1 rate. We can ship you two 10m boxes for just under the cost of one 15m box. You also gain 5 extra boxes. It is a little more handling for all of us but its well worth it, it if we can trim some of the high cost of shipping to you. *********************************** I would just like you to know that all of our dedicated employees together with our handicapped Friends at Headwaters are all very proud to serve you. Working for all of you is a very personal thing, that we all take very seriously around here. I Thank You for all of your patronage and I promise you our continued dedication to getting you the best quality feathers in the world. May God Bless us all in the up coming year so that we may all continue to work in this Business that we all love so much. P.S. If you will be attending this years Archery Trade Show in Indianapolis please be sure to stop by our booth #2443. “Where is the nearest dealer?” – That’s a question we hear all the time. Trouble is, most of our feathers are sold through archery distributors, so we don’t have a good dealer data base for referrals. The ATA has recently started an internet service which should make things much easier for us, for dealers and for retail customers. We are now referring requests for the location of nearby dealers to the ATA internet site: www.archerysearch.com. This site allows a consumer to do a very quick and easy search for dealers within a certain distance, or within their state. The information includes the dealer’s name, address and phone numbers, as well as a description of services offered and products for sale. If you are an archery dealer, then by all means, make sure you are listed in the data base. If you are not listed, then follow the instructions on the site to add your listing, or contact ATA for instructions. As of this writing, ATA is offering a FREE 1 year dealer membership to all dealers who take the time fill out a listing form. You do not need to have a web site or even a computer to be listed. In the Movies Again... and Again! It’s hard to believe, but Trueflight Feathers had starring roles and lots of “screen time” in both the hit movies, “Troy” (with Brad somebody as a co-star), and in the archery intensive “King Arthur”. Plus, we’ve just learned that our feathers played a major role in the TV shows, “Xena Warrior Princess” and “Hercules”! We don’t see a lot of movies up here in the Northwoods of Wisconsin, but somebody sure seems to have noticed the appeal of archery on the big (and little) screen. A: Yes, but virtual feathers are available for free on our web site! I know our finished product looks so uniform and consistent that you’d swear they are massed produced by a high tech machine. If only that were possible! Our feathers are real turkey feathers, painstakingly grown with great patience and skill by real turkeys. Bob Link and his dedicated people with equally great patience and skill, sort, grind and shape each feather, one at a time. By the time they are ready to leave our plant each has been individually handled by real people at least three times. A: Yes... the left wing! A: First you need to raise them on the Painted Desert. Then you need to keep telling them, “Bold is beautiful”, and show them lots of photos of Hawaiian Shirts. Finally, you need to wash and dye the feathers after they’ve been clipped from the birds – who’ve stubbornly refused to grow their feathers in any colors but white or barred white. A: More than 1000! We strive to make every feather that leaves our plant “The Best In The Industry”. We also pack at least 1% more feathers in each package or box just in case we somehow make a mistake in counting. 100 packs have a counted 101 feathers, 1000 boxes have 1010 counted feathers, and so on. A: The price of the feathers is only a small part of the cost of a finished arrow. Because we work so hard to supply 100% useable, high quality feathers, you save time and money by not sorting out and throwing away mis-cut, off color feathers. 50 Years ago, B.C. Roemer, Trueflight Feathers founder, noted that the most visible and eye catching part of any arrow is the fletching. That is as true today as it was back then. Quality feathers help sell arrows. No arrow is more costly than an arrow (or set of arrows ) that sits on the shelf, unsold because of “cheap looking” fletching. Quality feathers are the best are the best “sales aid” that a “quality arrow” can have! Disappointing High Speed Photos... Arrow Acceleration! When we learned that a typical archery arrow survives 500 Gs of acceleration on every shot from a bow, we right away thought that this would be a great thing to photograph. Surely, we thought, the feathers would be doing something very interesting when subject to that kind of force. It seemed we had the chance to photograph something very dramatic – something “unseen ever before by human eyes”. A 368 grain test arrow we happened to be shooting from a twin cam compound bow was exiting the bow at 270 fps. Since the “power stroke” of the bow was 20 inches, it was easy to calculate that the average acceleration over that distance had to be over 650 Gs. Keep in mind that we experience 1 G of acceleration here at the surface of earth due to gravity. At 1 G, a 150 lb. person’s feet press the ground with a force of 150 lbs. If that person was experiencing the same 650 Gs as the archery arrow, his feet would press the ground with a force of 97,500 lbs! Astronauts and fighter pilots can survive a maximum of about 10 Gs. We fired up our high speed camera equipment and took 3 exposures of the fletching area of a single shot during the 20 inch “power stroke”. The result is shown in the top image of Photo 3. The feathers look completely unchanged! We wondered what was going wrong. Surly the feathers would show some effect. Alas, in photo after photo, the feathers looked the same as they did standing still! Well, that’s what the feathers are supposed to do... they’re supposed to stay nicely upright, smooth, and efficiently doing their guidance all the way through the launch and beyond. So that’s a good thing – but it sure doesn’t make for a “dramatic” photo! This was a heck of a dilemma... the feathers were perfect, but we needed something more eye catching in the photos. Fortunately as I was walking through the local fishing bait shop I met an ambitious young plastic salamander. I had no trouble convincing the plastic salamander that a career in the glamorous world of high speed archery photography was a lot better than life as a fishing bait – no cold water, no fish hooks, and no hungry bass to worry about. We proceeded to strap our enthusiastic volunteer to an arrow shaft, set up the camera, and sent him on the ride of his life! The 2nd and 3rd images in Photo 3 show Mr. Salamander at rest, and then enjoying life at 550 Gs. Mr. Salamander most definitely got longer and thinner in a big hurry! As usual, the feathers didn’t seem to notice a thing. At last, this was an interesting photo. We were all set to do more tests with Mr. Salamander, but noticed he had lost some body parts on the first launch, and thought we heard him say something about medical benefits and calling a lawyer... so we looked for some other way to show the G forces. Water Balloons seemed a likely alternative – always fun, and unlikely to file complaints with OSHA. We simply put a teaspoon or so of tap water in each balloon, tied the knot, and taped these to the arrow shaft. 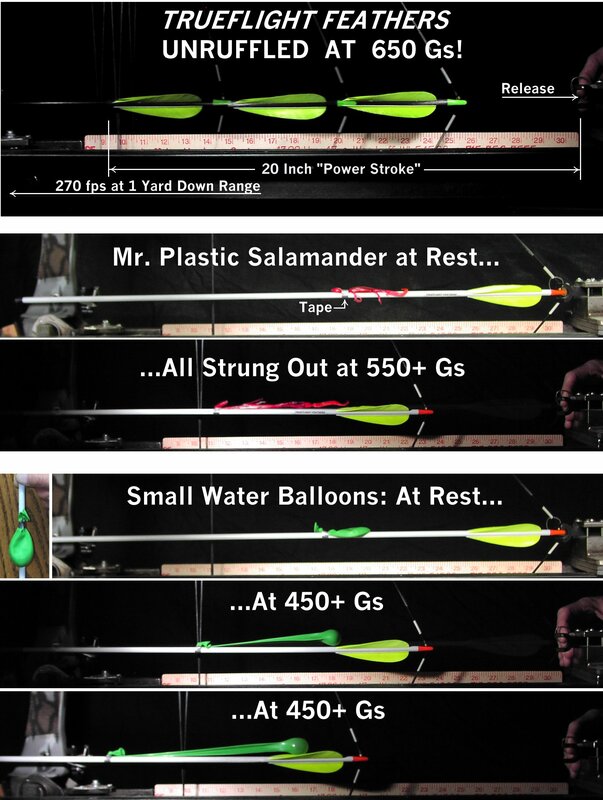 The last 3 images in Photo 3 show these water balloons at rest, and as the arrow accelerated on the bow. Ordinary tap water may not seem to be the most high tech thing in the universe, but the water in those balloons had definitely been paying attention to Isaac Newton’s laws of inertia “Mass” in general – whether it’s water, arrow shaft, or salamander plastic – most certainly resists acceleration... Big Time! Of course, I’m wondering if feathers are an exception to that rule... they seem to enjoy both the acceleration and the high flight speeds of an arrow. (Or at least they seem to ignore them!) Sir Isaac, we need some more analysis! The accelerations listed for the salamander and water balloon equipped arrows in Photo 3 are lower than the acceleration of the arrow alone, because the added mass reduces the acceleration and final speed of the arrow. All of the accelerations listed are approximate. 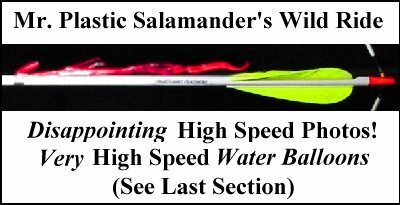 The accelerations shown for the salamander and water balloon arrows are particularly approximate, since the salamander shed body parts and the water eventually escaped from the balloon during the acceleration. This means the total arrow mass was changing during the acceleration making calculation of average acceleration very difficult. No living salamanders were harmed in making these photos. Mainly because using real salamanders would have resulted in a considerable mess in our test lab, and we are still cleaning up broken glass from shooting microscope slides with a .22 for the photos in last years newsletter! Text and Photos copyright 2005, Trueflight Mfg. Co., Inc.